Thomaston is located close to Maybole and Culzean Castle in Ayrshire. 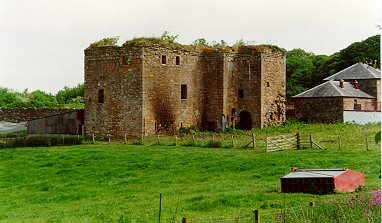 Originally built in the 13th century probably by Thomas Bruce, a nephew of Robert the Bruce, it was later extended with a tower house in the 16th century when it was then owned by the Corries of Kelwood. It later passed by marriage to the MacIlvaines of Grimmet who held the castle for a century. Around 1800 it was abandoned and today its shell is remarkably intact except for some of the upper features. The tower would have had 3 storeys and a garret. The basement contained 4 chambers including a kitchen and wine cellar from where access could be gained to the hall above. Other information is available about this castle from the Royal Commission on the Ancient and Historical Monuments of Scotland. Also see the Reconstruction Drawing by Andrew Spratt.